This article is about the town Nakhon Pathom. For other uses, see Nakhon Pathom (disambiguation). Nakhon Pathom houses a campus of Silpakorn University within the Sanam Chan Palace. 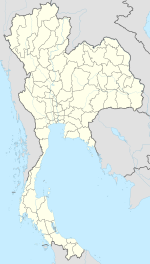 The city lies 57 km west of Bangkok. ^ "Phra Pathom Chedi". Tourism Authority of Thailand (TAT). Retrieved 28 May 2015. ^ "Wat Songdhammakalyani". On Thailand & Engaged Buddhism. Retrieved 28 May 2015. Wikimedia Commons has media related to Nakhon Pathom. This page was last edited on 31 January 2019, at 18:07 (UTC).